Passionate in the Finger Lakes: "Kiss My Grits! "...you will when you taste these yummy variations! "Kiss My Grits! "...you will when you taste these yummy variations! on the 1970's TV sitcom "Alice." The first time I learned about or tasted grits was when I first moved to the city of New Orleans a number of years ago. While standing in a fast-moving cafeteria line at Tulane University, I became nervous over what to ask for. What was normally one of the easiest tasks in life..to choose a quick breakfast, pay, sit down, and eat, became increasingly intimidating! The servers grew impatient with me when I stared at the choices and did not know what to say. "Come on hunny...make up your mind. . .you're holdin' up the line...are you a Yankee or somethin?" As they rolled their eyes and coaxed me on in their unique and lovely New Orleans (No Awleens as I learned quickly to pronounce) style, I quickly grabbed sunny-side-up eggs and grits with sausage and toast. Well, to my amazement and surprise I loved grits with eggs and since then have tried making grits in a few different ways. Grits, made from ground corn, are not only a breakfast staple for many, but can be used with or mixed in with other ingredients to create delicious and interesting lunch or dinner dishes. I am sure that on the Food Network show, "Chopped" chefs would even find a fantastic way of making it into a dessert! I will most likely include grits as a healthy choice, prepared breakfast-style on the menu here at 1922 Starkey House Bed & Breakfast. of the corn for his fee. 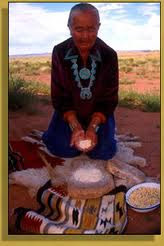 Also known as Hominy, they are similar to American cornmeal or European polenta. Usually, they are cooked using water, salt, then adding milk and butter. They are famous in the Southern parts of the US and just like staple foods in other countries, regions, and cultures, no one else can make them better. Here is (northerner) Chef John of www.foodwishes.com making Shrimp and Grits, proving that grits can even be made deliciously by anyone other than those who created them. Funny and entertaining! I cooked up some breakfast grits this morning and enjoyed them with just, a little butter on top. You may also dribble a dash of cream if you want to add extra richness. It is best to cook them a longer time adding milk then water alternately to fluff them. I also love them with "over-easy" eggs so that I can mix them into the yolks, ....yummy! They should be eaten quickly since they are starchy and will firm up fast. Actually if you let them firm up, you can wrap them in plastic wrap or form them in a small square pan. Chill for at least an hour. This form can then be sliced or cubed,to be used in other dishes like when cooking with polenta. Other links that may improve your enjoyment of grits are listed below. Thanks for reading and watching! Have a Blessed Day! we certainly love our grits here in FL.